In third grade Bob knew that books would be his life—reading them, writing them, and making them. He studied literature and languages, eventually earning a master’s degree in comparative literature. He has been a teacher, a book-store clerk, a journal editor, a translator, a book designer, a proofreader, a small-press publisher, a writer, and he has certificates in bookbinding and hand printing. For the past thirty-two years, he has worked as an editor for Zondervan, a division of HarperCollins Christian Publishing. 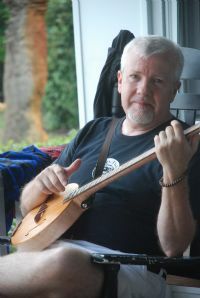 He is a founding member of the West Michigan Thomas Merton Society and serves on the board of the Calvin College Center for Faith and Writing. Bob and his wife, Shelley, play fiddle and banjo, respectively, in an old-time Southern string band called Gooder’n Grits. They play for barn dances and festivals throughout West Michigan. They also operate the Perkipery Press, a small chapbook publisher. They have three daughters: Abbie, Molly, and Lili.